Do you have A KTC FC1325N flash drive chip controller .Do you want to recover it .Download KTC FC1325N format tool V1.7.8 and repair any flash drive have KTC FC1325N chip vendor . 16 port test V1.7.8 software is designed to repair corrupted USB flash drives that have KTC FC1325N chip controller . KTC FC1325N format tool V1.7.8 can repair and update FC1325N Chip controller Firmware .Sometimes you have format errors like "Please insert disk " or "windows unable to format disk " or "the disk is write protected " , you can use KTC FC1325N format tool V1.7.8 to get rid off this errors . To repair KTC FC1325N usb flash disk , please follow the next KTC flash drive recovery tips .Note that 16 port test V1.7.8 tool can used only to update KTC FC1325N firmware So you must be sure that your flash drive chip vendor is KTC FC1325N . Download 16 port test V1.7.8 software from the download links in the end of this article . Insert corrupted KTC usb flash drive into your USB port . 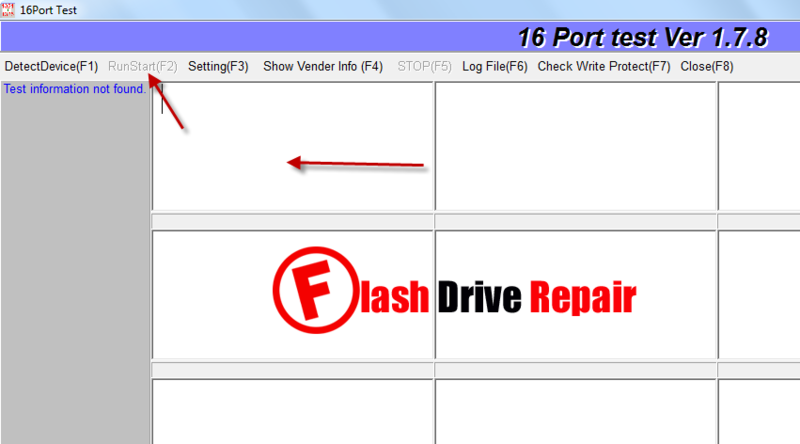 Open 16 port test V1.7.8 utility , you will see your flash disk information on the software interface . Click RunStart or press F2 to begin upgrading your flash drive firmware . Don't interrupt flash drive during formatting process .